The goal of this project was to develop and deliver a seamless high-accuracy digital elevation map of the State of Minnesota, based on data collected using LiDAR technology. Accurate topographic information will greatly enhance the ability of decision makers and resource managers to understand how water interacts with the landscape and will provide the foundation for developing innovative, effective, and defendable resource management strategies. The project will facilitate the flow of data between all levels of government: local, state, and federal. In July 2009, the Minnesota Legislature appropriated $8.3 million ($2.8 million each in fiscal years 2010 and 2011; $1.35 million each in fiscal years 2012 and 2013) from the Clean Water Fund of the Clean Water, Land and Legacy Amendment to help realize the goal of creating a seamless elevation model for Minnesota by filling in the areas where data either did not exist or was deemed to be old enough to be replaced. 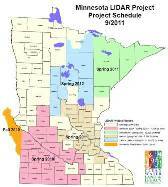 The project was coordinated by MnGeo's Digital Elevation Committee. On October 2, 2014, the project received a Governor's Geospatial Commendation Award. Project Area Map The total project area, encompassing 45,349 square miles across 47 counties, was split into five phases as shown on this map. The area included 17,260 square miles in 25 counties in southwestern Minnesota including Brown, Chippewa, Cottonwood, Douglas, Faribault, Jackson, Kandiyohi, Lac qui Parle, Le Sueur, Lincoln, Lyon, Martin, Murray, Nicollet, Nobles, Pipestone, Pope, Redwood, Renville, Rock, Sibley, Swift, Waseca, Watonwan and Yellow Medicine. 80% of the project area was flown April 8th – May 5th, 2010; the remainder of the project area was completed in November 2010. The U.S. Geological Survey contributed funding for this phase - see graphic. Covers 4 counties: Carlton, Cook, Lake and St. Louis, part of Itasca County and Voyageurs National Park in Koochiching County. Two pilot project areas – one encompassing Vermillion State Park and one capturing the west portion of Duluth – were also collected. Covered 15 counties: Anoka, Benton, Carver, Dakota, Goodhue, Hennepin, Isanti, Kanabec, Meeker, Mille Lacs, Morrison, Ramsey, Scott, Sherburne and Washington. Covered 6 complete counties in north-central Minnesota: Aitkin, Cass, Hubbard, Itasca, Todd and Wadena, along with a portion of Koochiching County. The Digital Elevation Committee defined the products to be delivered and the data collection, processing and accuracy standards to be followed. Building footprint polygons: A process to create rough building footprint polygons from the points in the LAS data that are classified as buildings (LAS Code 6) has been developed. This map shows the Root Mean Square Error (RMSE) by county or acquisition data block, as well as the acquisition year for each project area. The State of Minnesota LiDAR dataset was not all collected at one time or under one project. Although LiDAR data had been collected prior to 2007, it was felt that those datasets that were acquired following the USGS LiDAR Guidelines and Base Specifications would determine if an existing dataset would be part of the statewide dataset. The Minnesota DNR was the lead agency for this project but we must acknowledge the contributions of the International Water Institute, Fargo, ND and the various Minnesota counties who negotiated the release of their data for this public purpose. See Partnerships section below for more info. The project team received valuable in-kind assistance from local units of government, primarily county surveyor staff, to collect high accuracy survey points that were used by the project team to validate the data. These points were crucial to ensure that the data delivered by the vendor met the accuracy requirements agreed upon in the work order contracts. A structured process for collecting validation points ensured that they were comparable across the region.